Sonia Ramos Pascual is studying for a PhD in Mechanical Engineering. Originally from Madrid, Sonia completed her undergraduate studies at University College London (UCL). She moved to Bath to pursue her research interests in biomechanics. ‘I always had an interest in the human body. The organisation of our skeleton and muscles is fascinating from an engineering point of view. ‘As engineers we are trained to deconstruct big projects into small manageable steps’ says Sonia. ‘This is one of the fundamental principles of research. A good researcher is one that is not intimidated by the immensity of the task ahead’. Sonia’s research aims to understand the behaviour of the spine under physiologic loading conditions and how this changes with disease. She is investigating how the different structures of the spine contribute to its overall mechanical properties. This involves a detailed study of the behaviour of the motion segment. This is the smallest mobile unit within the spine and is made up of two adjacent vertebral levels and the surrounding soft tissues. 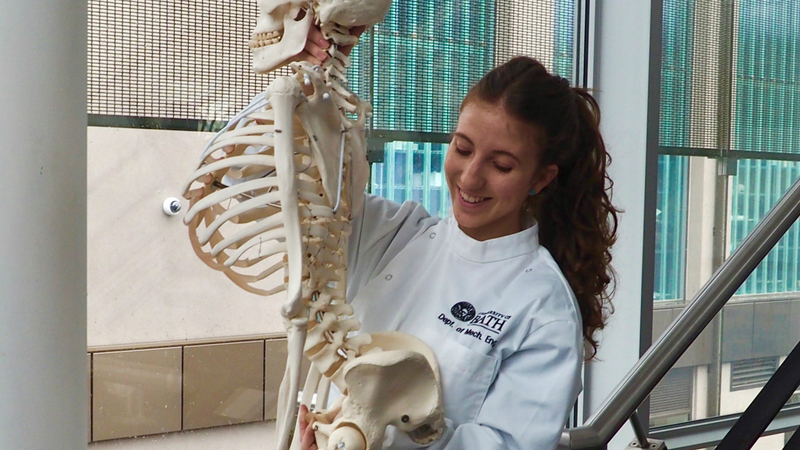 ‘I like the fact that my research will contribute to the understanding of the mechanical factors associated with back pain’. To get results from her research, Sonia has used a bespoke simulator developed in the Centre for Orthopaedic Biomechanics. 1 Holsgrove, T., Amin, D., Pascual, S., Ding, B., Welch, W., Gheduzzi, S., Miles, A., Winkelstein, B. and Costi, J. (2018). The equivalence of multi-axis spine systems: Recommended stiffness limits using a standardized testing protocol. Journal of Biomechanics, 70, pp.59-66.